Planning your trip to Thailand, visit to immigration, night at the bars ? This day, the first full moon of the eighth lunar month (in 2019 will be Wednesday 17 July), commemorates the Buddha's first sermon in the Deer Park in Benares, India and the founding of the Buddhist sangha (monkhood) about 2,500 years ago. 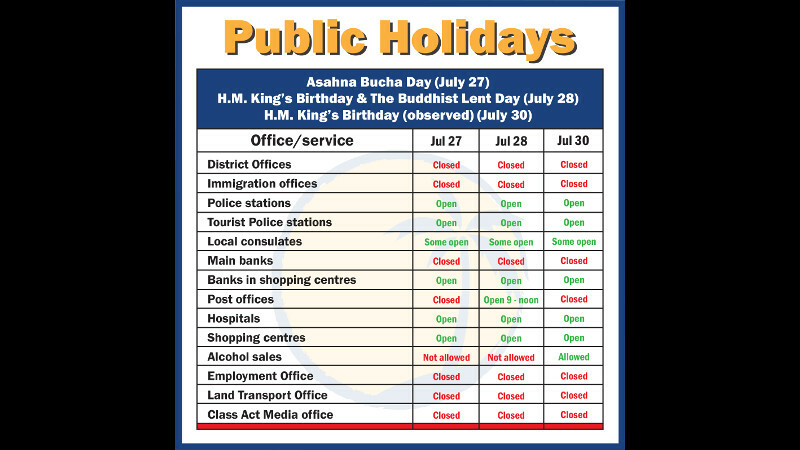 The day following Asahna Bucha is known as Khao Phansa or 'Buddhist Lent'. It marks the beginning of the three-month ‘Phansa’ period, during which all monks should stay in their temples and not travel. From 2017, the King's Birthday has shifted to 28 July, but 5 December remains a public holiday in Thailand to mark the birthday of King Bhumibol Adulyadej. Last edited by Hatari; 22nd July 2018 at 05:56. If you like drinking alcohol then I suggest purchasing what you need BEFORE the National holidays. How much planning does that take? Where it might screw you up is when taking a trip somewhere during that time, and the airports and highways might be busier than normal. Krissana said restaurants, karaoke shops, bus terminals and railway stations would be randomly checked on both days and retailers and proprietors of entertainment venues had been reminded of the ban. The only exemption is at airport duty-free shops, he said. Thanks for the list Hatari. I have a bad habit of booking my trips around these dates unknowingly. Quarky, Ian Forbes and Hatari like this. I'd actually like to experience being there on a religious holiday. I'm really not fussed about a night or 2 without booze. I imagine there's a nice buzz at the temples and stuff going on. Oh my God! A couple of days without booze! What will people do? The sky is falling! The world is coming to an end! Agreed. I unwittingly booked my trip to Thailand during Loi Krathong last year. The dates of Loi Krathong change every year, and last year they happened far earlier than normal in early November. I arrived in the Bangkok airport and the place was a total shambles of massed humanity trying to get out of the city. My normal 2 hour wait for a flight to Chiang Mai turned into an 8 hour ordeal. That was on top of having already spent 20 hours traveling from Canada. Then, when I finally got to the Chiang Mai airport there were 320 people in front of me waiting for a taxi into town. I just put one pack on my back, loaded my carry on luggage onto my bag with the little wheels, and walked the 3 km to my hotel. The traffic was so busy that walking was faster than riding in a taxi. I passed the lot of them stuck in a big traffic jam. I was totally thrashed by the time I got to my hotel, but happy to get there. If the alcohol ban is for 48 hours from 1201am friday my maths say they should sell alcohol from 1201am Sunday morning (all day fri & all day sat) ? The little bloke gets a holiday from school and all's it's done is rain....just talking to him..cabin fever mak mak 55 poor kid. I had Easter in Kiev in 2004 and seem to recall it was at the same time as ours...sunday on or after the first full moon after the equinox. Going to a nice little church where everyone held candles was a nice experience,the whole city actually....followed by a few rounds back in the room with the local girlie. Pity the local high school children on Mother's Day, events run from 8am to 8pm today, the ones in the school marching band had to be there 6.30am getting prepared for parade through town, and they have several performances during the day for groups of government people. Day off school, and work, tomorrow as the day is Mondayised when on a weekend. Mother’s Day was first introduced to Thailand on 15th April, 1950. In 1976, Mother’s Day was changed to 12th August to commemorate the birthday of Her Majesty Queen Sirikit ,the Mother of all Thai people. Last edited by Hatari; 12th August 2018 at 11:25. Just on the phone to the wife, all the mothers in the Village are together being entertained by the kids. Big day for the old girls. Mothers of all ages as are the "kids".